Venus is visible as a morning object, having recently passed greatest elongation west. 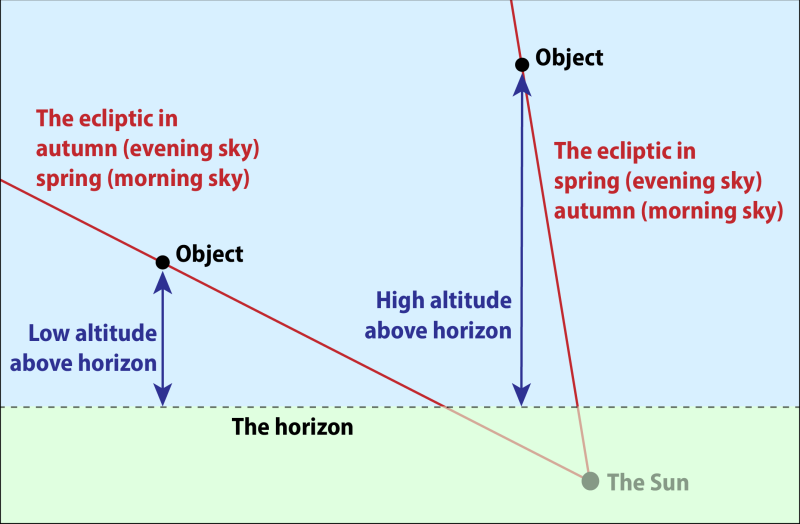 From Cambridge, however, it is not observable – it will reach its highest point in the sky during daytime and is no higher than 6° above the horizon at dawn. Venus is the second planet from the Sun, orbiting at a distance of 0.723 AU once every 224 days. It is our neighbour in the solar system, orbiting just inside the Earth's orbit. It is of a similar size to the Earth – around 95% of an Earth-width across – and has similar abundances of chemical elements such as carbon. For this reason, Venus is often considered to be the Earth's 'twin' planet. Even though Venus orbits closer to the Sun than the Earth, its surface receives less heat from the Sun since it is permanently enshrouded by thick cloud layers. These reflect so much sunlight back into space that they more than compensate for the increased intensity of the Sun's light. They also make it virtually impossible to observe Venus's surface, meaning that the planet presents a bland and largely featureless disk. Because Venus's orbit lies closer to the Sun than the Earth's, it always appears close to the Sun and is lost in the Sun's glare much of the time. The journey that Venus makes from the evening sky to the morning sky is much quicker than the reverse journey. 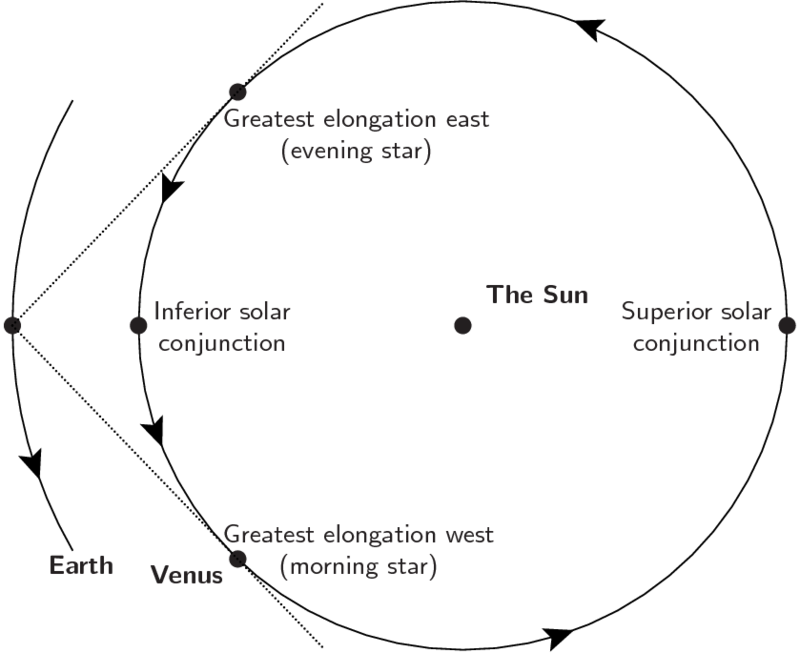 This is because Venus's orbit is so close to our own, so the points of greatest elongation are much closer to inferior conjunction than to superior conjunction. Click to expand. After passing behind the Sun, Venus first appears in the evening sky for a few months, lying to the east of the Sun. It then undergoes inferior solar conjunction, passing between the Earth and Sun a few months after reaching greatest prominence in the evening sky. Moving into the morning sky, it then reaches greatest prominence as the 'morning star' a few months later. The reverse journey, from the morning sky into the evening sky, takes much longer, as Venus travels a long path around behind the Sun. The moment when Venus passes behind the Sun is typically around seven months after reaching greatest prominence in the morning sky. It does not return to the evening sky until around a year after its disappearance from the morning sky. At each apparition, Venus reaches a maximum separation from the Sun of around 48°. However, some times of the year are more favourable for viewing Venus than others. From Cambridge, it reaches a peak altitude of between 18° and 45° above the horizon at sunset during each evening apparition, depending on the time of year. During morning apparitions, it reaches a peak altitude of between 22° and 44° at sunrise. At all times, Venus lies close to a line across the sky called the ecliptic. This line traces the path that the Sun takes through the zodiacal constellations every year, and shows the plane of the Earth's orbit around the Sun. Since all the planets circle the Sun in almost exactly the same plane, it also closely follows the planes of the orbits of the other planets, too. When Venus is widely separated from the Sun, it is separated from it along the line of the ecliptic. 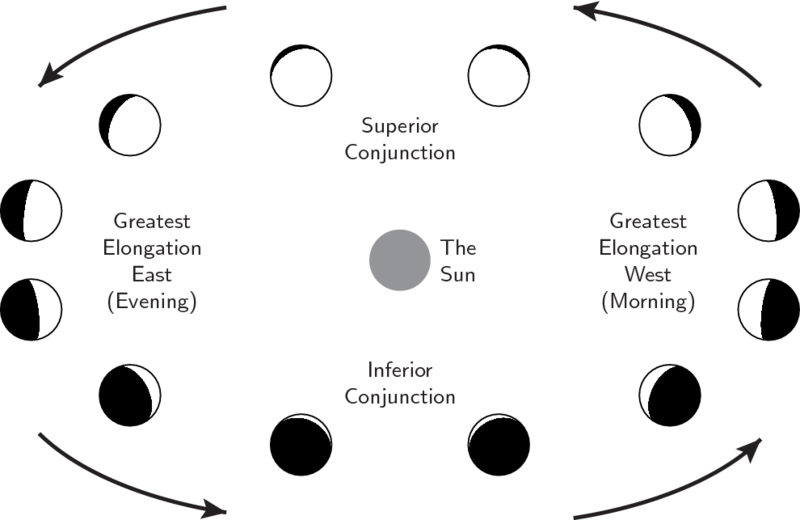 But, at different times of year, the ecliptic meets the horizon at different angles at sunset and sunrise. This would translate into Venus being at different altitudes above the horizon, even if its separation from the Sun was constant. 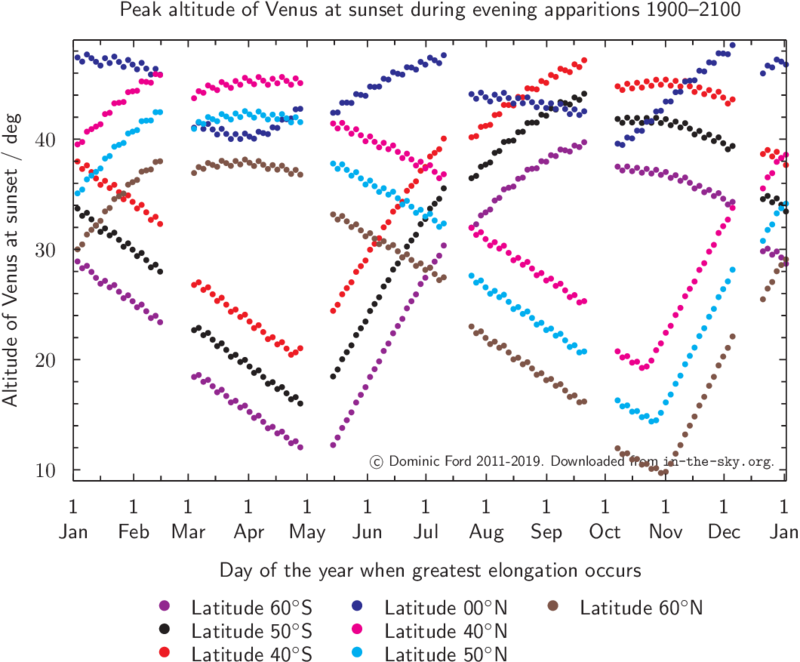 For this reason, the day when Venus reaches its widest separation from the Sun (greatest elongation) is not necessarily the same day when it appears highest in the sky at sunset or sunrise. 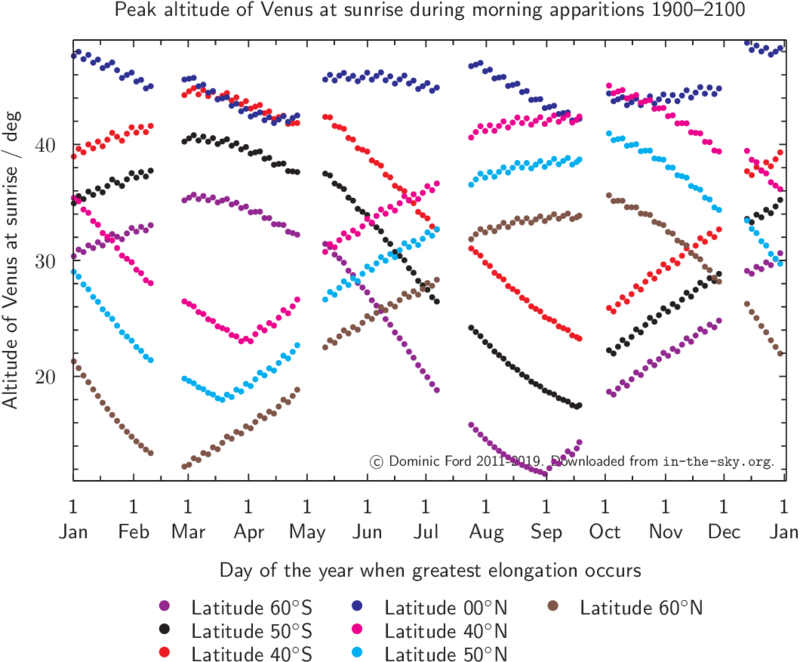 Venus typically appears highest in the sky a few days or weeks closer to the spring (evening apparitions) or autumn (morning apparitions) equinox than the moment of greatest elongation. Seen through binoculars or a telescope, Venus's disk is the largest of any of the planets on account of its closeness to the Earth, reaching a maximum size of 66" at inferior conjunction. Nonetheless, it remains just too small to be discernible to the naked eye. Even through a telescope, it is not possible to resolve any detail on its surface without specialist equipment, owing to the thick featureless cloud layers which surround it. However, as it orbits the Sun, Venus shows phases akin to those of the Moon, and these are quite apparent even through a pair of binoculars, especially if image stabilised. As it orbits the Sun, Venus shows phases like the Moon. When it is closest to the Earth, passing between us and the Sun, Venus appears almost entirely unilluminated. When it passes around the far side of the Sun, its disk appears almost completely illuminated. When it is prominent in the morning or evening sky, Venus is around half phase. Venus was the first planet ever to be visited by a space probe. After a failed Soviet attempt, the first spacecraft to successfully fly past Venus was the American Mariner 2 (1962). It has since been visited by more than 20 spacecraft, most recently the American Magellan (1989) and European Venus Express (2005). These have revealed that the planet's surface temperature to be 480°C – the highest average surface temperature of any body in the Solar System, and hot enough to melt lead and to visibly glow red hot. Its atmosphere has been found to be composed primarily of carbon dioxide, with traces of other noxious compounds such as sulphuric acid, which gives its clouds an acidic yellow hue. These extreme climatic conditions are less a result of Venus's proximity to the Sun, and more a result of the greenhouse effect: Venus has the strongest known greenhouse effect of any body in the Solar System. Current thinking is that the Earth and Venus may have been very similar planets at the time of their formation, but that a point of divergence came early in their history, when oceans formed on the Earth, allowing carbon dioxide to dissolve in the water and become locked up in carbonaceous rocks such as limestone (calcium carbonate). On Venus, this process never happened, and most of its carbon remains in the form of carbon dioxide in its atmosphere. Never attempt to view Venus through a telescope or binoculars if the Sun is still above the horizon. A momentary glance at the Sun through such an instrument is sufficient to cause permanent blindness.